There is no denying that I sometimes really miss hummus! It used to be my go-to snack with carrot sticks. I must admit that while I was in Israel recently, I had some falafel and hummus! Shhh, don’t tell the Paleo police! My gut, however, really doesn’t miss pulses and did not feel so clever after my indulgence. 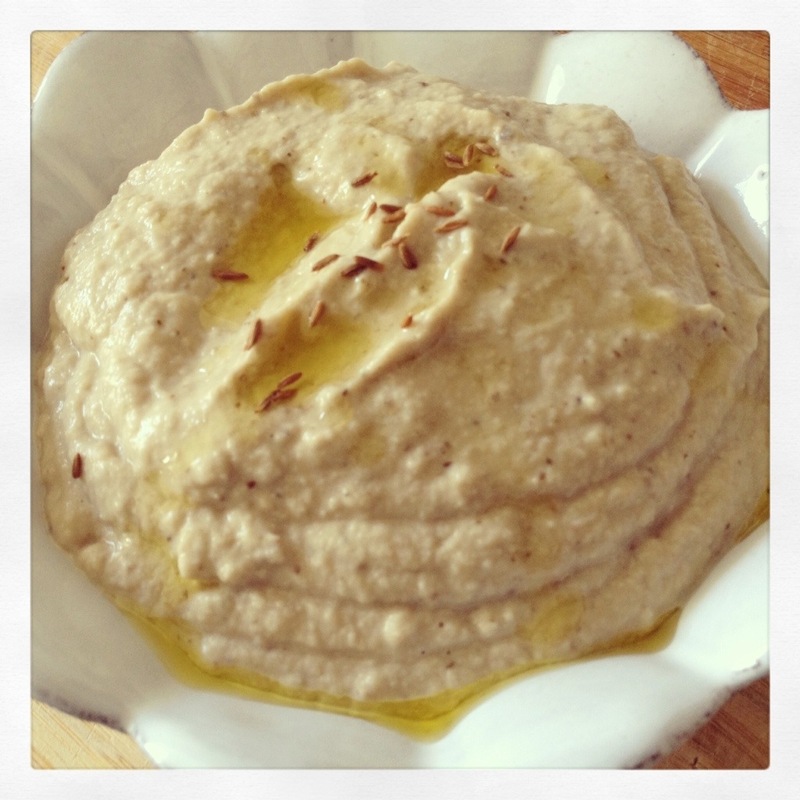 I decided I needed to come up with a Paleo-friendly hummus recipe. This is so simple to make and really delicious. 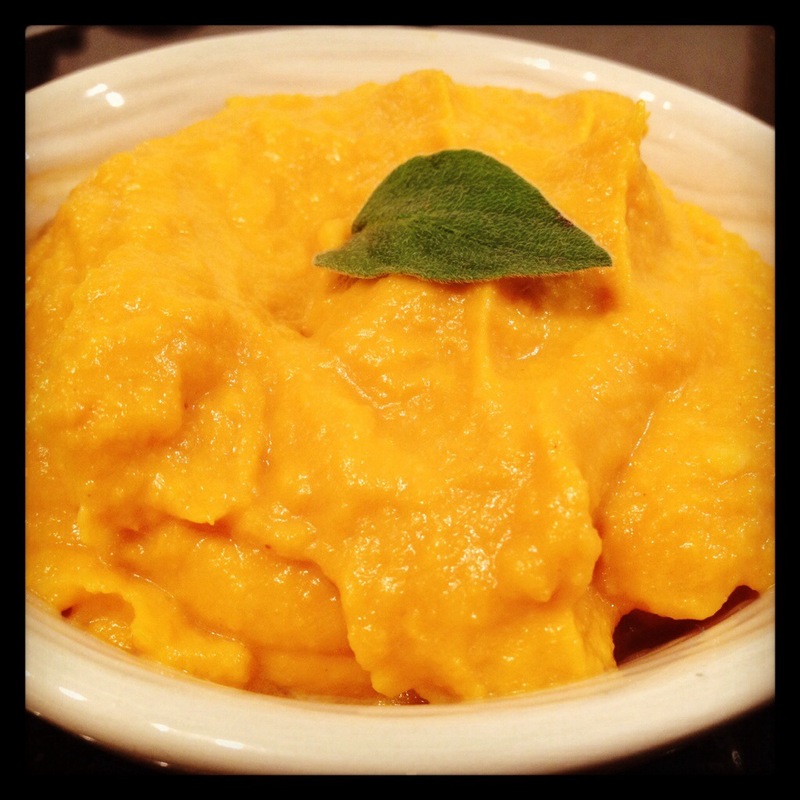 The sweetness of the butternut squash contrasts nicely with the tahini. Put all ingredients in a blender or food processor. Whizz until fully mixed and smooth. Posted in sauces, Vegetable side dishes and tagged Butternut squash, garlic, gluten-free, grain-free, hummus, lemon juice, low carb, organic, paleo, primal, tahini, whole-foods. Bookmark the permalink. Today was the most beautiful day! Hot and sunny. I lay outside for several hours topping up my much depleted vitamin D stores and listening to the birds chirping, with the cat snoozing next to me (I had the day off work in case you were wondering). I also had a chance to do a little cooking too. I’m not quite sure how, but I found myself in possession of 3 aubergines this morning when a third turned up in my organic veg box delivery to join the other two already lurking in my crisper drawer. I had a moment of inspiration to make some Baba Ghanoush. I had probably the worst I have ever tasted in my life a couple of weeks ago in a Lebanese restaurant. It tasted like the stuff you can get in a can in Arabic shops (I’m guessing it probably was!). My only issue today was that the tahini in my cupboard was out of date, so I had to make my own. The end result was delicious, although if I breathe on anyone this evening, they will die from inhaling garlic fumes! Feel free to go easy on the garlic if you don’t want to melt your partner’s face! Place aubergines on a baking sheet and bake in the oven for 20 mins. Turn the oven down to 140C and bake for a further 40mins. Remove aubergines from the oven and allow to cool completely. Place sesame seeds in a food processor and blitz until they form a dry nut butter consistency. Peel the skin from the aubergines and put into the food processor with the remaining ingredients. Pulse, scraping down the sides, until it forms a smooth paste. Serve with crudités, grain-free crackers, or as an accompaniment to Middle Eastern chicken or lamb dishes (watch this space for a Middle Eastern inspired chicken dish). Make sure everyone around you tucks into it too, to avoid unpopularity due to face-melting garlic breath! Posted in Vegetable side dishes and tagged aubergine, Baba Ghanoush, eggplant, garlic, lemon juice, tahini. Bookmark the permalink. Mama and Papa Gorgeously Grain-Free came over for lunch the other day. I knew I was going to make the Chorizo Meatballs from Diane Sanfilipo’s 21 Day Sugar Detox, but the vegetable accompaniment was completely dependent on the contents of my veg box which had been delivered that morning. I have to admit I was slightly disappointed when I opened it up to find 2 large heads of chicory and a bag of watercress (amongst other things). Neither are my favourites, however I was suddenly hit by a moment of inspiration to combine the two into a salad with some crunchy toasted pecans and a light and refreshing blue cheese dressing. Sorry all you Paleo people, but you will have to substitute some homemade ‘baconaise’ dressing (which would no doubt be equally as delicious). Whizz all dressing ingredients in a blender. Arrange watercress as the bottom layer in a serving bowl. Arrange the chicory quarters on top. Squeeze the toasted nuts in your hand to break them up and sprinkle over the top. Grind a little fresh black pepper over the salad and serve. 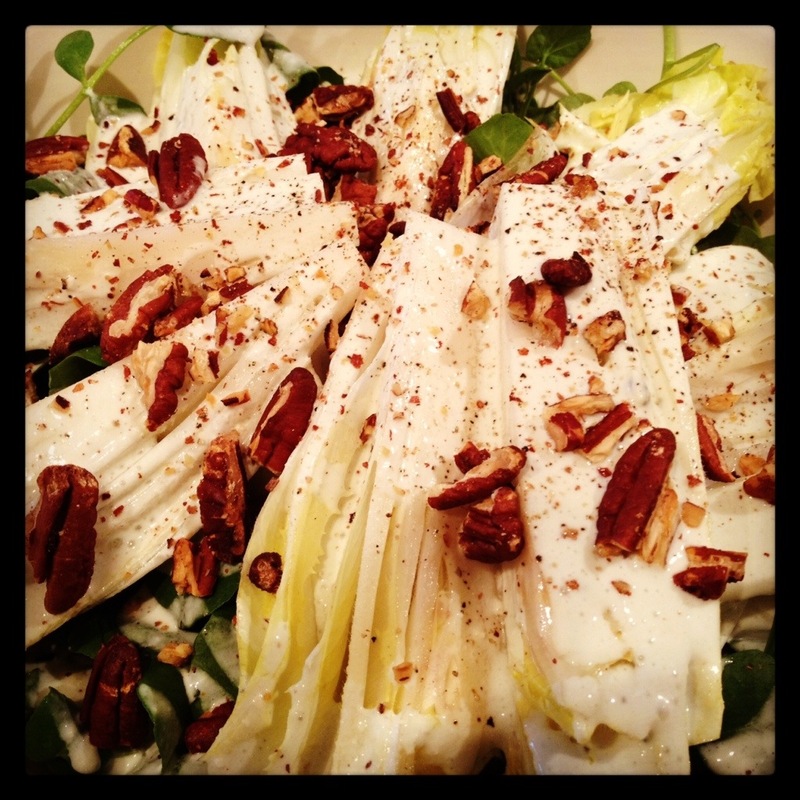 Posted in salads and tagged blue cheese, Chicory, gluten-free, grain-free, lemon juice, low carb, paleo, pecans, primal, salad, watercress, whole-foods. Bookmark the permalink.